People who created, supported or were otherwise involved with cryptocurrency projects that are now functionally dead, have all the value they invested in them trapped. They cannot transact or trade these coins. This trapped value can serve as a source of growth for cryptocurrency markets if it is freed. It will also be beneficial for those who hold these failed coins because it will allow them to join a new community that can achieve the network effect that the coins they hold failed to achieve. There are more than 4,500 different cryptocurrencies; only about 1,400 are traded on exchanges. This is the by-product of the growth rates that cryptocurrency markets had in the last few years. As a community, cryptocurrency users and enthusiasts need to take care of these failed projects. CoinJanitor is the first service offering to do so, and one of the first to open the discussion about what to do with these failed projects. To reduce cryptocurrency market dilution and restore lost value to the Crypto Economy, by providing holders, community members and creators of failed coins, a buy-out, a way to join a project that has the network effect that the projects they created or supported failed to achieve, and implementing a subsequent systematic burn of the coins bought out. Profiling the coins that should be considered as failed. These coins will be PoW coins primarily, that were launched more than 2 years ago, are not traded on exchanges and have a market cap smaller than $50,000 USD. 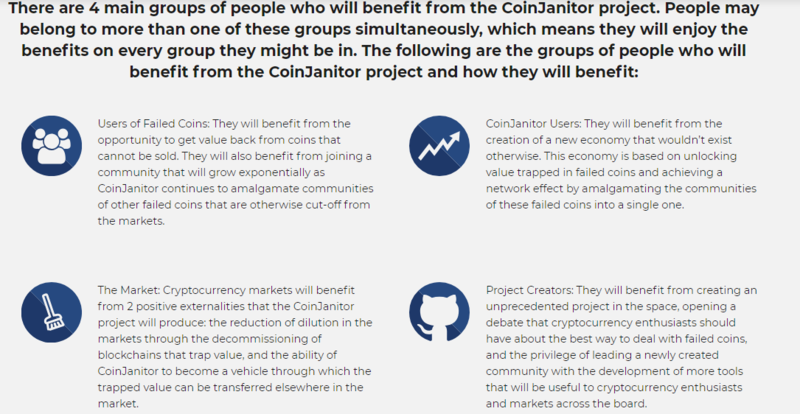 After profiling, CoinJanitor will reach out to the coin’s creators, their users and their wider community to set up a buy-out program and have the creators turn over access to GitHub, other code repositories and all marketing assets. The buy out program will have a deadline. All buy outs willbe done using the CoinJanitor token to avoid pump and dump schemes, and to avoid becoming a de-facto exchange service for coins that are otherwise not exchangeable. Once the buy out on a given project ends, CoinJanitor will proceed to burn the coins it bought. When the coins are burnt, CoinJanitor will proceed to disable or decommission the underlying blockchain. To do this, CoinJanitor has access to mining equipment that can be directed towards these blockchains to implement its decommissioning process, if need be. The team will proceed to organize relevant code repositories, turning every piece of code it acquires from these projects, into an open source “blockchain library” that any member of the community will be able to access for future project development, for academic purposes or any other goal they have in mind. In parallel, CoinJanitor will start compiling relevant data about all the coins it buys out, to provide market information that is otherwise missing. The opportunity to get value back from coins that can not be sold and to join a community that will grow exponentially, achieving a network effect through the amalgamation of communities that are otherwise cutoff from cryptocurrency markets altogether. Creating the first project of its kind in cryptocurrency markets, opening the debate about what to do with failed coins and leading a newly created community in the development of more tools that will be useful to cryptocurrency markets altogether. Reduction of dilution and the transfer of value that would be otherwise lost, into top ranked cryptocurrencies. Criteria and methodology development and initial coin research. Development of proprietary profiling systems. Identification of preliminary candidate coins. Release of API into CoinJanitor market date. 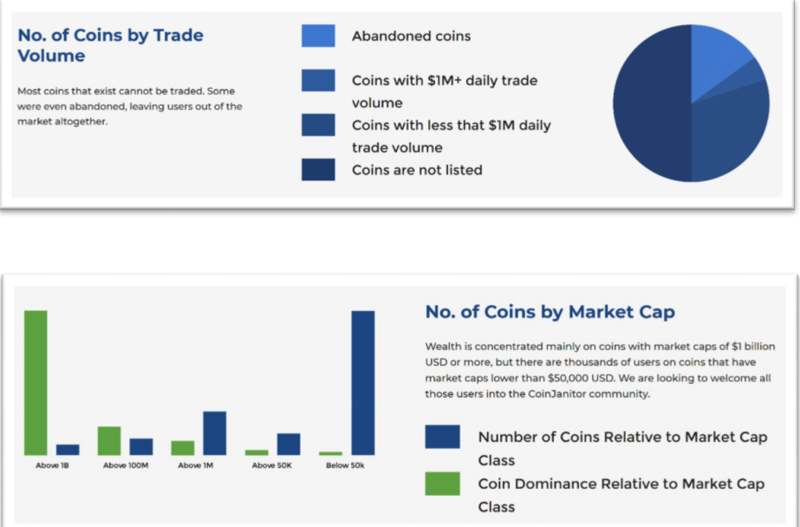 First state of the market report on all coins.